Ledger Nano S is one of the cheapest and best hardware wallet which also offer supports for DASH coins. You need to install the Dash app on the device to manage DASH coins with the Ledger app. The Dash support app is developed and supported by Ledger and available for the Ledger Nano S and Ledger Blue both devices. Trezor: It is the highly secure wallet solution with local transactions. It was extended to Dash support by the Satoshilabs. Though it is highly secure, it is not that much convenient to the users. Keepkey: It is the first and foremost hardware wallet with local transactions that has been extended for Dash support. The users can access this wallet with the help of a Google chrome plug-in. It provides a special protection to the users’ account and avoids hacking, thereby ensuring safety and security. Its cost is somewhat higher, but due to its security feature, it is preferred by most of the crypto currency users. Exodus: It is a highly convenient and easily usable wallet. It is an excellent wallet solution for the crypto currency users, since it overcomes the issues faced by various cross – platform Dash wallets. It facilitates efficient exchange or transfer of crypto currencies, with the help of its in – built exchange feature. It also supports some other types of crypto currencies, in addition to Dash. Jaxx Wallet: Jaxx is a multi-platform and multi-coin wallet. It is developed by Decentral and provide support for seven different cryptocurrencies, which includes Bitcoin, Ethereum, DASH also. This wallet has features like: cross-platform pairing, embedded ShapeShift and multi-coin functionality. It’s available for 9 different platforms including Linux, Windows, Apple, Android and Apple devices, and Chrome. DASH Core: DASH core is a desktop based official Dash wallet released by core community. Like other wallets it is fully featured Wallet and P2P Client, including features like InstantSend, Governance, PrivateSend, and Masternode management features. Electrum: Electurm is a fast, safe and secure wallet. Electrum wallets are avialbel for different coins including DASH. Electrum-Dash is easy Dash client based application. It protects user from losing their coins in case of any backup mistake or computer failure, because there is an option to recover your wallet from a secret phrase that you can save or write on paper. You can start using it instantly as it does not download the full Dash blockchain. 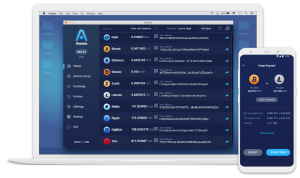 Atomic Wallet is a new multi-assets solution for convenient storage of DASH. For sure, Atomic can be used not only as DASH wallet: it currently supports over 300 coins and tokens. Besides, every weekly update adds new crypto assets and features. Desktop app is available for Windows, MacOS, Ubuntu, Debian and Fedora. Alpha versions of Android and IOS mobile apps will be released in November, 2018. Private keys are stored on user’s device and generated from mnemonic. Uberpay: It is an excellent wallet solution for multiple crypto currencies. It mainly supports Dash, but it too supports some other crypto currencies in addition to Dash. It can be accessed in mobile devices too. It facilitates the storage of private keys in the system. It also facilitates transfer of crypto currencies with the help of its in – built exchange feature. While broadcasting transactions, it provides security by hiding the users’ IP address. Holytransaction: It is a software wallet solution that can be accessed via online mode. It has gained a great fame among the Dash enthusiasts, though it has been introduced recently. It is a convenient and easy to use wallet, but the only drawback is that the company has control over the private keys. Coinomi: It is a multi currency ands easily usable wallet solution containing medium anonymity. It holds an in – built exchange feature and scan be accessible over Android mobile devices. It mainly focuses on dash support, but its services have been extended for other crypto currencies also. It lets the users to have control over their private keys. While broadcasting blockchain transactions, it masks the users’ IP address. It is compatible with hardware wallets like TREZOR and Ledger Nano S wallets and allows to create a local key store wallet to store Dash. It also supports features of InstantSend or PrivateSend. In this article we have discussed best dash wallets to store dash coins. Hardware wallets such as Trazor is the best choice but a bit costly. Alternatively, you may choose wallets discussed above to make have control over your private keys and make your cryptocoins secure. Hope you enjoyed this article. Please share your feedback and experience with us in the comment section below.